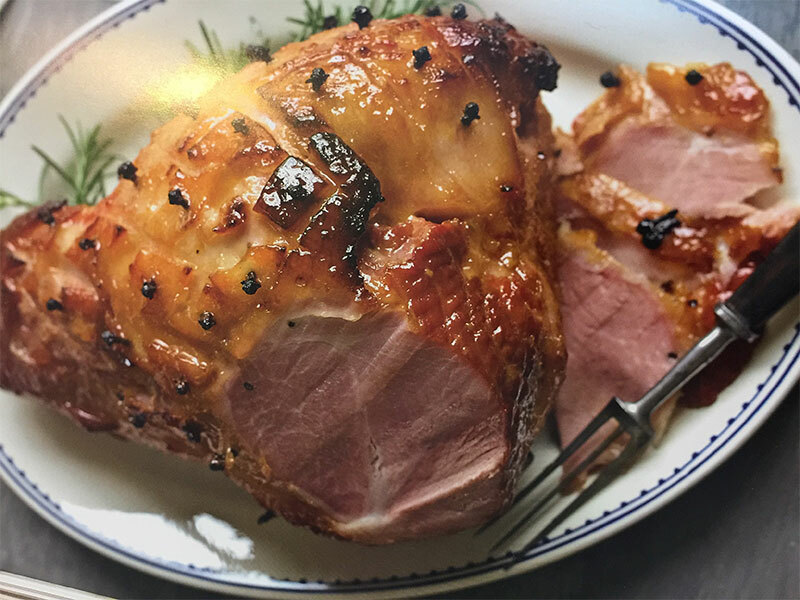 Baking your own leg ham can be a simple process if you have a good recipe, removing the skin is not difficult, then all you need to do is score and stud the fat with cloves, heat the glaze, brush it on and begin baking. The reward begins with the amazing aroma as it cooks and culminates a superb flavour. Use a small sharp knife to cut around the ham shank in a zig zag pattern, about 10cm from the end. Starting at the other end of the ham, run your fingers between the skin and the flesh. Continue sliding your fingers further up the ham until you reach the shank end. You are aiming to keep the fat attached to the ham flesh and remove the skin. Once loosened, carefully remove the skin in one piece (pic 1). To make the glaze, put all the ingredients in small deep saucepan over medium heat. Ensure you peal the mangos and blend them into a puree with the kaffir lime leaves. Add the honey, white sugar and bourbon. Bring to boil, then reduce the heat and simmer for 5-10 minutes or until thickened slightly. Score the fat in a diamond pattern, cutting about 1cm deep and being careful not to touch the flesh. Press a clove into each diamond (pic 2). Line a heavy baking tray with a double layer of foil and place a rack on top (use a racked tray if you have one). Put the ham on the rack, brush with glaze (pic 3) and bake for 20 minutes. Glaze again and bake for a further 20 minutes, then glaze and bake for a final 20 minutes until golden. Carve the ham and serve warm at room temperature.